The Band are pleased to announce that we will appearing in concert on Friday 11th November 2016. 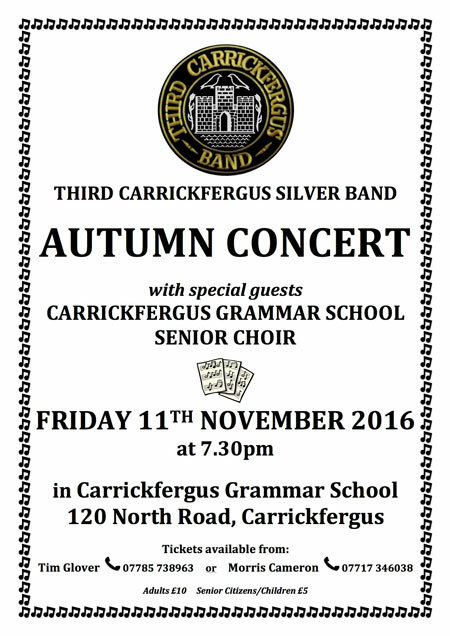 The concert will be held in Carrickfergus Grammar School and will feature our special guests, the award winning Carrickfergus Grammar School senior Choir. Tickets for the concert are available in advance from Tim Glover on 07785738963 or Morris Cameron on 07717346038 and are priced at £10.00 each (Children and Senior Citizens £5.00). Some tickets will also be available at the door on the evening. We hope you will be able to join us and we look forward to your company for a great evening of musical entertainment.